I don't think it's ever come up on this blog before, but I was a band geek back in the day—a proud band geek. I played sousaphone in marching band. In December 1995, our 125-piece unit, including color guard and drum majors, loaded onto a plane and flew to Orlando, FL for the band trip of a lifetime. We marched in the Citrus Bowl Parade and took part in a few festivities right in the Disney parks. One of the highlights: a meal at King Henry's Feast, a now-defunct Medieval Times ripoff featuring live jousting, whole turkey legs served right on the bone, and an open invitation to refer to your waitress as "wench." I don't recall the beverage we were wassailing with—it may very well have been Coca-cola or something lame like that—but part of the program involved our host, King Henry, shouting out, "All Hail!" and we'd respond in kind, our cheap tin goblets raised high above our heads, "Wassail!" and then we'd take a drink. Our feast fell on one of the days immediately following Christmas, and the "banquet hall" there in Orlando was still decorated for the holidays, so I've always remembered the word "wassail" as something very Christmassy and medieval. Apparently, we had been wishing one another "good health" and imploring some Anglo-Saxon gods to give us another good apple harvest the following year—or Coke harvest, as the case may have been. Whatever that beverage was I was wassailing with those 20 years ago, it wasn't anything like what TJ's has offered us in this Winter Wassail. Because if it had been anything like this, I most certainly would have remembered it more vividly. 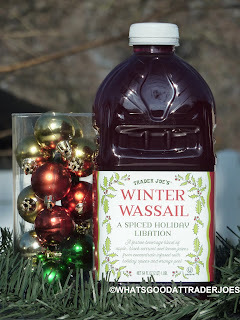 Not just because this Winter Wassail is delicious, but because it's so unique. It's everything that the Spiced Cranberry Cider should have been, and then some. Granted, there's no cranberry juice, but it's sweet, tart, spicy, and has three types of real fruit juices. Weirdly, this tasted like Hawaiian Punch to me. A more grown up, holiday version, of course but I couldn't shake the feeling that I should be drinking this out of a bright blue can. Lol! Actually now that you mention it, it's not that far off from "Spiced Hawaiian Punch." 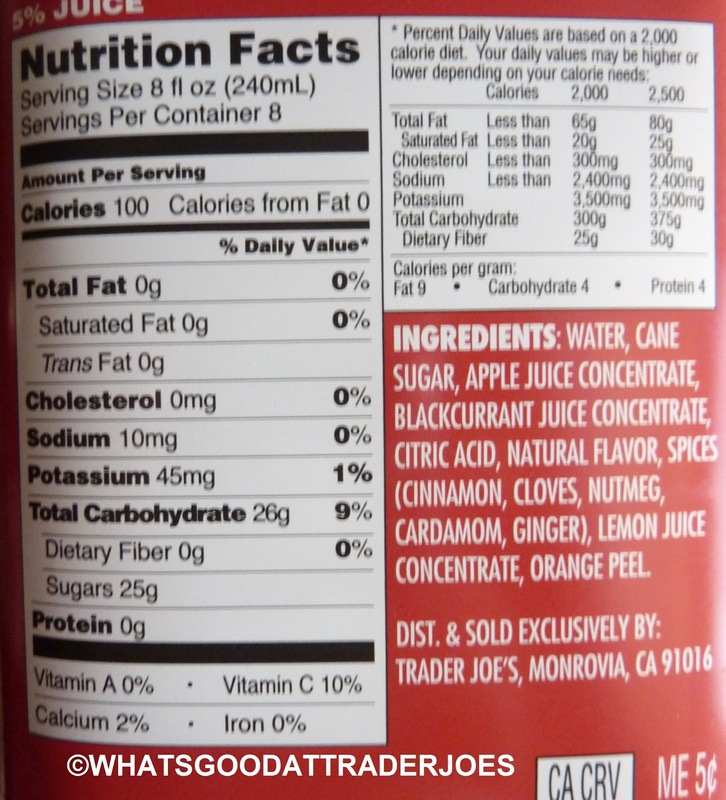 Good thing I like Hawaiian Punch (minus the HFCS). We'll accept an 8, Mr. Rodgers. It's Christmas (or soon to be), after all :)/ We prefer it warm (which is unusual for me) and have heard (but not verified) that a little Triple Ginger Brew mixed in is wondrous. Damn! I was literally holding this in the store and decided it was too heavy to schlep around nyc with what else i was buying....! Gotta go back, this sounds amazing. I also enjoy the Winter Wassail cold with Don Q Cristal rum. Add ice for a more refreshing taste. Ugh I went to try this today and apparently they are already done selling it, as it's "seasonal". It's not even Christmas yet...lame. Can't find it at any TJ in Los Angeles! If you've ever enjoyed a baked ham seasoned with cloves, you'll be disappointed to discover that the bottle of Trader Joe's Winter Wassail does NOT include one. Indeed, I'm put off by the stuff because it's spiced so similarly to a delicious ham, but without the gratification of chomping into that delicious holiday meat. 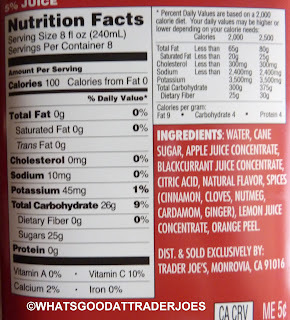 Perhaps the worst Trader Joe's product we've ever had. Much too tweet and far too heavy on the cinnamon and nutmeg spices. Oh, well... no one's perfect.